Democrats in the crowded field of more than a dozen candidates are calling for more action to clean up per- and polyfluoroalkyl substance pollution, a key concern in some areas of New Hampshire, which holds the first primary of the campaign season. PFAS is providing a platform for hopefuls to slam President Trump's environmental agenda as they make their case to voters about who is the best person to take on Trump next year. And while New Hampshire, whose primary comes just after the Iowa caucuses, isn't the only state to suffer from PFAS issues, it's helping candidates connect more closely with voters in the Granite State. 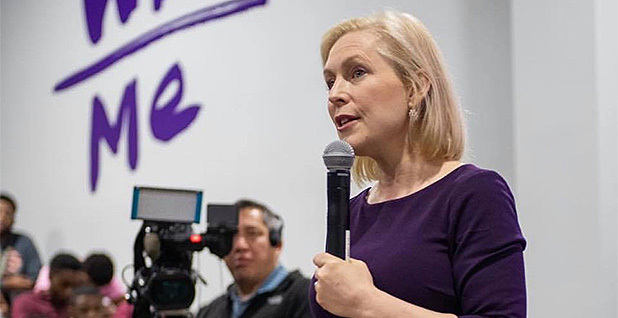 Sen. Kirsten Gillibrand (D-N.Y.) has taken the mantle on PFAS, going so far as to call for a complete ban on the family of thousands of man-made chemicals that are used in applications like firefighting foams and nonstick cookware. Environmental advocates call them "forever chemicals" because they can last years before breaking down. "I think we have to ban the entire class of chemicals because they will be determined ... as carcinogens," Gillibrand said at a March 15 campaign event in Portsmouth, N.H., that was structured as a forum on water contamination problems, according to Foster's Daily Democrat, a Dover, N.H., newspaper. "If the EPA turns a blind eye and is unwilling to do the right thing, then you'll have at least two more years when nothing is done. It's one of the reasons why we must defeat President Trump," Gillibrand said. "He is a toxic president to America, that is a fact," said the senator. "He does not care." While the White House's fiscal 2020 budget proposal calls for new money to communities affected by PFAS, it would cut research dollars (E&E News PM, March 18). The issue is of particular importance to Gillibrand, who used to represent an upstate New York Hudson Valley district while in the House. Hoosick Falls, N.Y., has grappled in recent years with drinking water contamination from perfluorooctanoic acid, or PFOA, a substance in the PFAS family that is a suspected carcinogen. The pollution has been linked to a plant owned by Saint-Gobain Performance Plastics and formerly operated by a predecessor corporation of Honeywell International. Gillibrand's comments came weeks after then-acting EPA head Andrew Wheeler released an action plan for PFAS, which included steps to help clean up contamination and, by the end of the year, make an official determination that would lead to regulations limiting allowable drinking water concentrations of two key PFAS chemicals. Wheeler's announcement, however, angered Democrats and health advocates, who argued the plan does not take action quickly enough. As an environmental problem, PFAS doesn't pose the same national concerns as something like climate change. But its impact is being felt in places like Pennsylvania, West Virginia and Michigan. In New Hampshire, focus has been on the Seacoast area, where PFAS pollution has been found or suspected in Portsmouth, Merrimack, Greenland and elsewhere. David Konisky, an environmental policy professor at Indiana University Bloomington, said PFAS could get much more attention in early primary states like New Hampshire and Michigan. "PFAS are still a pretty niche issue, so it's hard to imagine them emerging as part of a national political discourse in a presidential election. But that said, in particular states as part of the primary process, I could very easily see candidates trying to use the issue to position themselves with voters in states where it's already been in the headlines," he said. On the other hand, if candidates are looking for policy issues that would help them stand out from the rest of the field, they might not want to dwell on PFAS. Other environmental issues, like climate change, could provide for more differentiation, Konisky said. "I'm not sure that it would separate them from other candidates, because I imagine they would all take similar stances on the need for the EPA to do more, and for the federal government to provide resources for cleanup of contaminated sites." The idea of wide-ranging policies to ban PFAS alarms the chemical industry. The American Chemistry Council is open to certain standards, particularly on older PFAS compounds that have proved harmful, but argues that painting the whole class with broad brushstrokes is wrong. "PFAS is a diverse family of chemistries that have differing characteristics, formulations, intended uses, and environmental and health profiles," Rob Simon, vice president for chemical products and technology at the ACC, said in a statement. "Because of these significant differences, it is inappropriate to pass one-size-fits-all regulations of PFAS as a class, which is an approach that has been rejected repeatedly by U.S. agencies and other international regulatory bodies over the years," he said. Lobbying on PFAS has increased significantly since the issue gained prominence on Capitol Hill, with lawmakers pushing bills and demands to the administration (E&E Daily, Feb. 5). Many presidential hopefuls are indeed targeting the entire category of chemicals. Former Maryland Rep. John Delaney said he visited the Coakley Landfill in New Hampshire in February. "I toured the Coakley Landfill in Greenland which is suspected of high levels of PFAS and am aware of how concerned people are on the Seacoast about water contamination," he said in a statement. "I think that it is unacceptable that the Trump EPA is dragging their feet on this." In addition to Gillibrand's call for a complete ban on PFAS, she signed on to a bipartisan Senate letter Feb. 1 with 19 colleagues calling on EPA to set hard limits on concentrations of PFOA and perfluorooctanesulfonic acid, or PFOS. Two more of those signatories are now running for the Democratic nomination to be president: Sens. Bernie Sanders (I-Vt.) and Elizabeth Warren (D-Mass.). Those three senators also signed on to a May demand that the Trump administration release federal research on PFAS consumption limits, following a report that administration officials had tried to hide it. Sanders is the lead sponsor of the "Water Affordability, Transparency, Equity and Reliability Act," S. 611, which he introduced in February. It is meant as a comprehensive drinking water plan, including provisions to help water utilities clean up PFAS and assist householders served by them. Warren's campaign pointed to legislative amendments she's sponsored that would have mandated a study and a federal register on firefighters' exposure to PFAS. She also criticized David Dunlap, a former Koch Industries Inc. official now working in a senior research position, for his alleged role in EPA's PFAS action plan in a letter to Wheeler. Sen. Kamala Harris (D-Calif.) has criticized the Trump administration on Twitter for its actions on PFAS. "Everyone has a fundamental right to drink clean water. The EPA's decision to delay setting standards for PFAS, toxic chemicals in drinking water that can have devastating impacts on human health, is completely unacceptable," she tweeted after EPA released its action plan. Gillibrand, Harris, Warren and Sen. Cory Booker (D-N.J.) are all among the 30 co-sponsors of Sen. Tom Carper's (D-Del.) "PFAS Action Act," S. 638, which would mandate that EPA declare all PFAS chemicals to be hazardous, thus allowing contamination areas to be declared Superfund sites. Booker wants PFAS banned from firefighting foams and consumer products immediately, said spokeswoman Sabrina Singh. He also endorses a drinking water standard and a hazardous substance designation for the entire class, to enable Superfund cleanups. "EPA's failure to regulate PFAS chemicals is putting the health of millions of Americans at risk. Unfortunately, this is just another example of the Trump EPA failing to protect public health," Singh said. Former Housing and Urban Development Secretary Julian Castro largely agreed with his Democratic rivals, saying in a statement to E&E News that the federal government "must set strict standards for the presence of carcinogenic materials, including putting forward enforceable maximum contaminant levels and allocating federal resources to combat unacceptable levels." Castro also said the Trump administration "clearly does not prioritize the health and safety of American citizens, as proven by their actions and budget." Washington Gov. Jay Inslee (D) has taken action on the state level to stop PFAS contamination. He signed a bill last year banning certain PFAS chemicals from being added to firefighting foam, and another to ban some PFAS compounds from food packaging.